JD.com (JD) is often referred to as China’s Amazon. However, JD is online retail shopping with a difference. Firstly, buying behaviour and the online shopping experience in China is quite different to Australia and the United States. Online shoppers in Australia typically buy discretionary items such as books, shoes and clothing. In China, people buy discretionary items as well as daily consumables, like toothpaste. For consumers in China, the norm is to check the cupboard in the morning and order daily items for delivery that afternoon. The other big difference is delivery time. Unlike Amazon and JD’s larger domestic Chinese rival Alibaba, JD’s delivery time is measured in hours not days. The CEO has heavily invested in logistics and infrastructure to ensure authentic, quality goods are delivered the same day if ordered by 11am. At JD, 90% of products are delivered within one day while for Alibaba 70% is still undelivered after 3 days. Driven by the vision of its founder and entrepreneurial CEO, Richard Liu, JD’s goal is to provide consumers with “the best online shopping experience.” To this end, enhancements to the platform and extending the product range are key parts of the company’s strategy. For example, as part of its regional expansion plans, JD recently announced plans to open its first office in Melbourne in February 2018. Unlike Amazon’s arrival in Sydney, JD’s presence in Melbourne at this time is not directly competing with Australian retailers, rather it should be a boost for local retailers. The strategic intent is to satisfy the demand on JD.com for high quality Australian and New Zealand manufactured goods and brands across a range of categories including cosmetics and food. In addition to the export of goods, JD is looking for domestic warehousing and logistics partners. Headquartered in Beijing, JD is the largest B2C online retailer in China by transaction volume and revenue. The company was founded by Richard Liu in July 1998 and its B2C platform went online in 2004. The company has moved from a consumer electronics retailer to selling higher margin general merchandise. As at 31 December 2017, JD had over 292 million active users purchasing, on average, 25.7 items a year – refer Figure 1. (1) Defined as customer accounts that made at least one purchase during the twelve months ended on the respective periods, whether through online direct sales or online marketplaces. Data for all periods exclude Paipai.com unique customers. The CEO Richard Liu holds a 20% stake in the business and has the bulk of his worth invested alongside the shareholders. By tapping into and catering to the big switch to mobile devices, under Richard’s leadership JD has delivered impressive results over the last two decades, with growth in the order of 40% per annum as just one indicator of this. The CEO’s vision for the customer experience, commitment to quality and social conscience has shaped the company’s strategic direction and culture. His steadfast commitment to preserve brand intellectual property by eliminating fake goods from the site, which remains a big issue for rival Alibaba, has made JD a trusted brand and generated considerable user loyalty. Richard’s position on treating employees equitably, for example paying social and medical insurance for all JD employees, has garnered employee loyalty and positively contributed to the culture needed to mobilise a workforce to meet demanding delivery timeframes and standards. 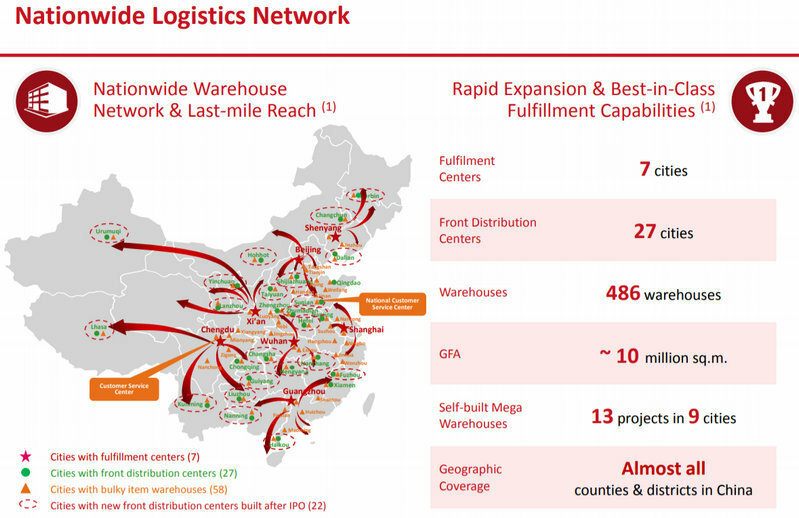 A proprietary logistics network (as illustrated in figure 2 below), established as subsidiary JD Logistics in April 2017, comprising 7 fulfillment centres and 486 warehouses covering 2,830 counties and districts across China and staffed by JD employees. An independent finance business, JD Finance, which launched China’s largest crowdfunding platform in 2014. A strategic partnership with Tencent, giving JD exclusive access to Tencent’s WeChat and Mobile QQ platforms. This translates to the capacity to reach more than 900 million consumers using these platforms. A strategic alliance with Walmart. In our view, the company’s investment in infrastructure and logistics is its key competitive advantage. JD’s investment in hard infrastructure assets, such as warehouses and technology, has created the capacity to provide same day delivery. JD is the world leader in artificial intelligence drone technology. It deploys drones capable of moving cargoes up to 1 tonne and the company is working towards autonomous delivery. Based on our estimates, if JD’s competitors were to emulate JD’s infrastructure assets it would take them five to seven years just to get to where JD is today. Accordingly, we believe the investment in logistics at the expense of the range of items, relative to competitors, was a sound choice. Over time, it is easier to catch up and expand the range of products than it is to replicate the infrastructure. Further, JD’s decision to staff, not outsource, the handling and delivery of goods has provided the necessary controls to ensure the condition of delivered goods meets the requisite standard and reduces/eliminates counterfeit products. As discussed during our podcast, JD’s decision to have in-house last mile delivery staff has created the capacity for JD to have face to face contact with its customers. In our view, building a personal relationship with customers in an online world is invaluable and extends JD’s competitive moat. By comparison, Alibaba is plagued with issues in relation to counterfeit/fake goods and its outsourced fulfillment model means the company has significantly less control over delivery timeframes. Given JD’s significant competitive advantage on fulfilment and delivery, together with JD’s track record for reinvesting, we expect JD to continue to deliver on its strong growth potential, particularly as JD's product range catches up to rival Alibaba and it starts to take market share away from them. Richard Liu is a key driver of JD’s success. Richard and his experienced executive management team meet our Great Management investment criteria. This founder led business has remained focused on its core goal (delivering the best online shopping experience) and maintained its commitment to innovation and reinvestment of profits in order to extend its competitive advantage and create value over the long-term. The following quote from Richard Liu says it all. “Our decision early on to build out our own logistics network has paved the way for JD Logistics to become the industry leader it is today. The shift throughout global e-commerce towards our model is vindication of the path we chose. This current funding round sets the stage for us to further invest in expanding our lead in the sector in areas like automation, drones and robotics. JD Logistics will continue to support both JD.com’s e-commerce business and the logistical needs for a wide range of industries for years to come.” Source: JD.com Press Release, 14 February 2018, “JD.com Announces Financing Agreements for JD Logistics”. An important aspect of our valuation process is growth – runway, opportunities and results. The consumer upgrade cycle in China has an enormous runway. While we have seen similar cycles before, for example the United States in the 1950’s and Japan in the 1970’s, we’ve never seen a cycle of this size in any one country before. JD, along with our other holdings in Chinese technology companies, has and will continue to be at the forefront to capitalise on this growth cycle in China. As was the case with western technology giants, we believe the market has, and continues to, underestimate the pace with which JD can continue to grow. The shares currently trade at 1x sales. By comparison Amazon’s valuation is 3.1x sales. Based on our valuation and analysis, JD is significantly cheaper than its western counterparts, even when factoring it’s AWS cloud business and has a larger runway and therefore larger growth opportunities. JD trades at impressive enterprise value to revenue multiples. At the current expected sales growth rate of 30%, by next year JD will trade at a similar multiple to struggling brick and mortar department stores in the US, where growth is next to 0. Since adding JD.com to the portfolio in July 2016, the stock price has increased by over 115%. At Peters MacGregor we judge management on their record of achievement. Richard and the management team at JD have followed the long-term playbook of sacrificing margins today in order to gain scale. We believe the company is well positioned to profit from China’s unprecedented consumer upgrade cycle and deliver value to its shareholders over the next decade. Wayne Peters is Chief Investment Officer at Sydney-based, global fund manager, Peters MacGregor Capital Management. Disclosure: Peters MacGregor Capital Management Limited holds a financial interest in JD.com and Tencent through various mandates where it acts as investment manager.